Magic has consequences, warns Mother Possum, but Lillian is too young to understand what that means. All she knows is she wants to be a girl again instead of a kitten. In her human form Lillian and her aunt live on a small, remote farm surrounded by Tanglewood Forest. After lessons and chores, Lillian spends her spare time searching the forest for fairies. It’s a magical place, the forest is, and seems a perfect home for fairies. But all Lillian finds are cats—lots and lots of cats who follow her through the woods and meander up and down the hills and valleys with her as she explores. After racing with a deer one afternoon, Lillian falls asleep under a tree, much as she’s done many other days. She wakes to a painful snakebite on her ankle and before she can move away, the snake strikes again, then again. Through the fog of pain and approaching death she glimpses a circle of cats gathering around, watching her intently. As Lillian fades away, “falling upward into a bright tunnel of light,” the cats kill the snake and discuss what to do about her. “We have to save her,” says one. “We can’t. It’s too late,” says another. “Unless we change her into something that isn’t dying,” suggests the wisest cat. It’s settled. Magic pulses three times around the circle of cats—special cat magic that calls Lillian’s soul back in a blaze of light. When Lillian awakens, she licks a paw, washes her face, and discovers she is now a small calico kitten. Being a cat does have its advantages, but they are not for Lillian. She finds her way to Mother Possum who changes her back into a girl after warning her to be careful what she wishes for. Magic is not free. It always has a price. Back at the farm, Lillian discovers that the poisonous snake has killed Aunt. Fate, it seems, intends that someone should die today, if not Lillian, then Aunt. The Creek family matriarch—a witch among her own people—sends Lillian off on a perilous quest to discover how to make things right. Lillian travels through wild lands with a trailing fox and a heart filled with determination, for she is not willing to trade Aunt’s life for her own. Mother Possum is not the only purveyor of magic Lillian meets. The shifty Bear People trick her into working for them in return for a promise they never keep; however, the Father of All Cats and the Apple Tree Man are more helpful. Lillian is an engaging young heroine filled with curiosity, kindness, loyalty, and the will to do what’s right. Difficult though it may be, she alone will control her destiny. Renowned author Charles de Lint, a master of juvenile fantasy, creates a unique story that seems somehow familiar and new at the same time. Part folktale, part fable, the lyrical language is a perfect match for the web of magic and mystery he weaves. But the story is only half the story in this lovely, thick-papered and well-made book. Artist Charles Vess often partners with Mr. de Lint, and his vibrant full-color illustrations impart luminous texture to Lillian’s mission. In one image, Lillian as a calico kitten creeps toward Mother Possum’s swampy tree home where 100 empty medicine bottles dangling from dead branches gives the place an eerie atmosphere. The double-page spread depicting the Bear People’s settlement is a surprising cross between a Tibetan monastery and Rivendell, the Elven village from Lord of the Rings. It delights the eyes, compelling the reader to pause and contemplate visiting such a place. Would it require a passport, one wonders? Lillian is indeed, pure of heart, and her goodness comes full circle. The conclusion is predestined, but highly satisfying nonetheless. 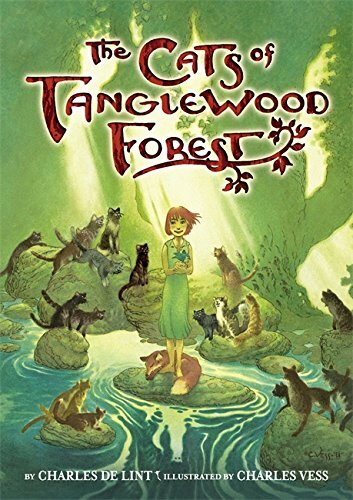 The joy is in the reading: the wondrous adventures of Lillian’s journey through Tanglewood Forest and her marvelous encounters with those who dwell within its enchanted boundaries. Gorgeous pictures. Talking animals. Magic. A bit of fright. What else could a child ask for in a story?